Gold had its best day in over a month this week. On Thursday, gold prices pushed back up to over $1,300 after continuing to struggle from last week. Gold held on to the gain through Friday. Silver prices hovered around $16.55. A stronger dollar was keeping gold down earlier in the week. However metals got a slight boost Wednesday from Federal Reserve data released. Gold got its big push from heightened geopolitical fears though. President Trump announced Thursday that the much-anticipated summit with North Korean leader Kim Jong-Un was cancelled due to, what the President called, “tremendous anger and open hostility” by the North Korean regime. Investors were hedging risk with gold this week. 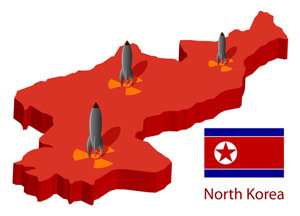 Conflict with North Korea has been a significant market mover in the past, and the de-escalation talks had alleviated those fears until this week. After the news on the North Korea summit this week, bond buying started up again, leading to a fall in yields. However, U.S. bond yields have been surging over 3% recently. It is alarming because rates could be rising too fast. Minneapolis Fed President Neel Kashkari warned of exactly that this week. His fear was that the Fed is getting too aggressive with its rate hikes. Dallas Fed President Robert Kaplan expects the economy to slow over 2019 and 2020, and is also more dovish on future hikes. However the Fed is still projecting more hikes this year. Right now, the yield curve is flattening. Short rates are moving faster than long rates and indicates an expected higher interest rate environment. As the curve flattens and inverts, this is often a harbinger of recession, as we have discussed before. Every Fed tightening cycle has produced some kind of “event” or crash. Check out some charts and examples here. For example, in 2004-2006, the Fed tightening cycle seemed benign, but in its wake followed the housing bubble collapse that set off financial contagion in the whole global financial system. The liquidity that has been driving the current bull market is fading, and it is going to cause volatility to skyrocket. The question of how this will affect U.S. debt is noteworthy as well. The U.S. continues to pile up debt (over $20 trillion) that is already near impossible to pay back. Rising interest rates means higher payments to service the debt. Interest payments alone on the national debt is on pace to take over as the number one budget line item. Rising rates can push gold prices down, since gold bears no interest and thus becomes less desirable. But when they are rising too fast in this kind of environment, it can lead to a crash and recession. 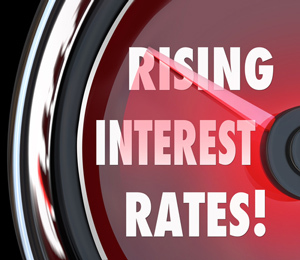 Interest rates are sounding alarm bells in a big way in some of the periphery, European economies too. 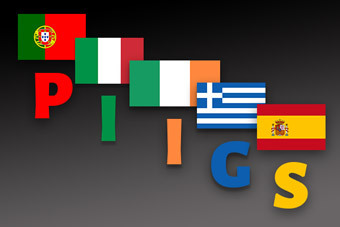 Notably, there seem to be problems stemming from the “PIIGS” (Portugal, Italy, Ireland, Greece, and Spain) – the acronym for the countries at the hub of contagion during the last financial crisis. This week, it was primarily the Italian economy and political scene triggering uncertainty and alarm. On Friday, Italian bond yields soared with the 2-year having its biggest one day rise in five years. the 10-year was at the highest in over a year. Partly this is due to uncertainty over Italy’s new government. It is being formed primarily by populist, Euroskeptic parties Lega and Five Star, and they have a penchant for spending and an anti-EU outlook. The new government has supposedly even proposed a new currency, “the mini-BoT” for parallel trading, perhaps in an attempt to ditch the euro. Consequently, the sell-off in Italian bonds widened the gap over German bund yields by 18 basis points. Portugal and Spain also saw a significant sell-off, which could signal that Italian contagion is spreading and economic momentum slowing. Greece, which was the hub of contagion during the last crisis, is continuing to have its economy artificially propped up, having just completed its fourth bail out. The possibility of Italian contagion spreading would put pressure on the euro. If Lega/Five Star embark on their proposed idea of departing from the euro and EU, this will be even more pronounced. Economic weakness or collapse would force the European Central Bank (ECB) to halt its tightening plans and force Mario Draghi to embark on more quantitative easing. Contagion in the eurozone could certainly spread through the whole financial system. In this case, expect gold prices to soar. 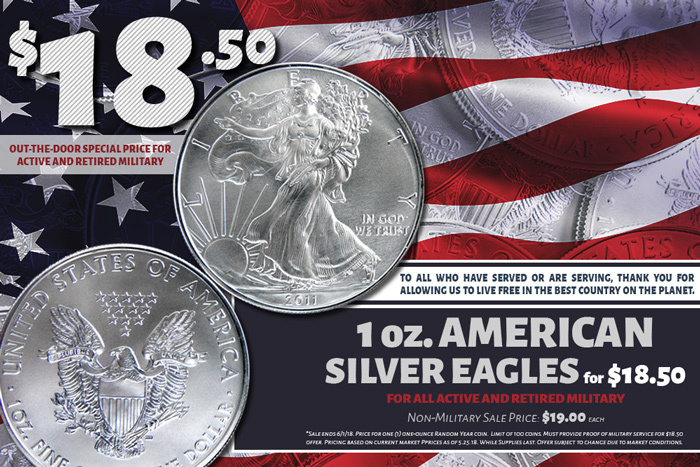 While supplies last, all active and retired military personnel can take advantage of this special pricing on beautiful 1 ounce Silver American Eagles. Non-military clients can also save with $19 pricing. Come to our office Tuesday-Friday this week to lock in your order. You can also set an appointment or check inventory by calling us at 602-955-6500.